Prop betting is one of the most entertaining types of bets you can place on a sports game. While prop bets are sometimes made on obscure and random occurrences that just take luck to win, they can also be expertly made on individual players and team stats that require a sharp bettor to win. Prop bets are great because they serve two purposes. First, they allow action-seekers to bet on literally every facet of the game for constant excitement and entertainment. Second, they give bettors more flexibility to put their knowledge and skill to work to make money. We will definitely talk more about these different bet types, especially the more skill-based ones a little later. Let's start off by making sure that we all understand what a prop bet is and all of the little nuances that surround it. 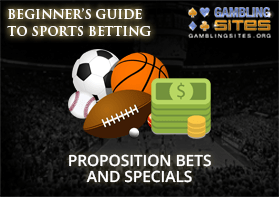 Prop bets is short for proposition bet, and just another term for a Specials bet. The three terms are all completely interchangeable as they all refer to the exact same type of wager. Depending on what part of the world you are in, one will be more common than the other. They are also sometimes referred to as novelty bets or side bets as well. For the sake of this article, we will be referring to them as prop bets, but just be aware that we mean the same thing for every different name of this bet type. It's also important to point out that the term prop bet can be used in other situations and industries outside of the sports betting arena. While these are quite similar, we will only be referring to prop betting as it pertains to sports betting in this article. Now that we've gotten the logistics out of the way let's talk about exactly what a prop bet is. The answer to that is there really is no "exact" answer to what a prop bet is because it encompasses such a wide variety of different bets. The term prop bet is used to refer to a wide array of different sports bets that can be made on the more obscure happenings or occurrences of a game that typically do not have a direct effect on the outcome of the game. If you're more confused now, that's ok. Let's look at some examples of prop bets, and it will all make sense. Which team scores first in a game? Will a baseball team score in the first inning or not? Will there be a safety in the football game? Will a certain player have more or less than 1.5 touchdowns? Will there be a hole in one in a golf tournament? Any bet on the outcome of these questions would fall under the classification as a prop bet. While these things would have an indirect effect on who wins the game, for the most part, they are independent of that outcome. If a team wins the coin toss, they will get an advantage on getting the ball when they want, but it's not going to ensure that they win the game. If someone gets a hole in one in a golf tournament, it will give them a great score on that hole, but won't directly ensure that they are going to win the tournament. The point we are trying to make here is that prop bets are wagers on the more obscure facets of a game. As we mentioned earlier, prop bets can be divided up into two main categories - the fun prop bets and the skill prop bets. One of these two categories is made strictly for entertainment purposes and will be very hard for you to find an edge. This doesn't mean you shouldn't make them, but you should just realize they are mainly for entertainment value only. The other category requires in-depth knowledge, and a keen eye for spotting and predicting things in the game that you think will happen. These bets are entertaining as well, but can also be a perfect means for making some money. Let's take a look at both types and talk about the benefits and drawbacks of each. If you're a smart cookie you probably already figured out that this is the category that is designed mainly for entertainment value. Let's lead off with a few examples of fun prop bets. Will the coin toss before the game be heads or tails? Will Madonna wear fishnets during the halftime show? What will the color of the Gatorade dump on the winning coach be? As you can see, these are incredibly fun bets to bet on, but there really is no way you are going to be able to "expertly" make a pick here. Unless you have some sort of hidden insider information, you will be effectively guessing on all of these. For the most part, sportsbooks will cap the amount that you are allowed to bet on these fun prop bets. This is mainly to protect them from the possibility of leaked information. Obviously, most people aren't going to know what Madonna is going to wear during the halftime show. But, if you happen to know someone who knows her stylist, you might be able to get that information. This is the category of prop bets we'd like to spend a bit more time talking about as they are the ones that you can actually use your skill and knowledge to try and make some money. As we did with the fun prop bets, let's lead off with a few examples to show you what we're talking about. Will this player score more or less than 2.5 touchdowns? Will there be at least one scoreless quarter? Will more or less than 3.5 players on a football team score? If you couldn't tell, all of these prop bets have to do with football. Keep in mind that there are prop bets available on most sports, particularly if it is a big game. You'll also notice that we gave more examples this time than with the fun prop bets. The reason for this is that all skill prop bets are not created equally, and we need to point out a few differences, so you are more informed. The big difference between the skill prop bets that are offered is the degree of skill that can be applied to the bet. Let's look at two different skill prop bets to see what we mean. 1Prop bet one - Will this player score more or less than 2.5 touchdowns? 2Prop bet two - Will there be overtime? Prop bet one is asking you to determine how many touchdowns you think a certain player is going to score during a game. This is typically offered on bigger name skilled players. This bet is one that you can apply a lot of skill and knowledge to making an expert pick. You can look at how good you think that player is and how well you think they will perform against that particular defense. You can also take a look at what you think the team's strategy is going to be and how often they are going to go to that player. See a skilled position player that you think is going to be completely shut down? You can bet on that. There will still be a bit of luck with this type of bet as games are unpredictable, but you can make a more educated guess which is all you are ever trying to do with sports betting. Prop bet two is asking you to determine if the game is going to go into overtime or not. This bet is on the complete opposite end of the spectrum from prop bet one and is dangerously close to falling into the fun prop bet category. Realistically speaking, we could have put it in the fun prop bet section, and it would fit just fine. The reason we put it in the skilled section is that you can make an argument that a skilled bettor could determine that the game was going to go into overtime. Do you think the teams are that evenly matched that there is a higher likelihood that they will go into overtime? Are the teams both touchdown machines that never go for two, so it's more likely they can end the game with the same score? A lot more luck is going to be required here, but you could make the argument that a little bit of skill can get you a more educated guess here. The most important thing to point out here is that the sportsbook is not going to be labeling their prop bets offered into these different categories. It will be up to you to determine which prop bets are strictly for entertainment value and which require skill and can be part of a good money making system. These should be fairly easy for you to tell the difference, but we just wanted you to be aware that they weren't going to be separated out for you. If you can find a lot of stats and data to make your selection, it's probably a skill based prop bet. If you find yourself looking for the answer in the whispers of the wind or asking your dog for help, it's probably a fun prop bet. Either way, they're both great bet types, and both serve their intended purpose well. We're going to walk you through a few examples of prop bets and how to read what the payouts for each are going to be. They are fairly straightforward, but we want you to be as comfortable as possible when you get ready to place your first prop bet online or in the sportsbook. 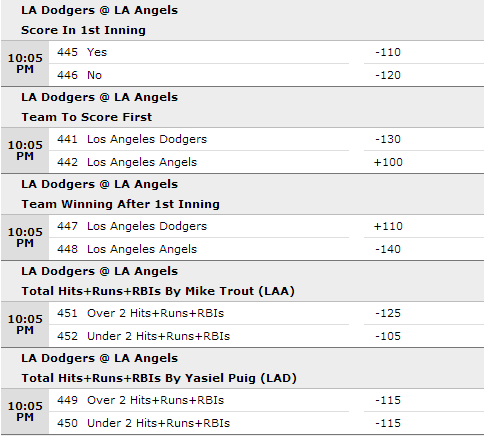 This is a screenshot of some of the prop bets that are offered on a baseball game on a US based sports betting website. What you see in the bold above each bet is the game that it is in reference to and then what the actual prop bet is. This is the exact same as a normal sports bet would be listed. Notice it doesn't say prop bet anywhere or skill vs. fun. Some sportsbooks will list all of their prop bets together in a labeled section, but I have yet to see any that distinguish as to how much skill is required for each bet. If we take a look at the very first bet on the list, it says "Score In 1st Inning." This bet is asking us if we think that either team is going to score in the first inning or not. This would probably be in our skill based category as we could look at the top of the lineups for each team as well as historically how each team starts off the game. All you are selecting here is either Yes, someone will score a run in the first inning, or NO, no runs will be scored in the first inning. If anyone scores, Yes wins. If no one scores, No wins. The number to the right of each bet option is the amount that you will be paid for a winning selection in moneyline format. Let's say we think that both teams are hungover and will be off to a slow start and won't be scoring in the first inning. We bet $100 on NO at -120. If we are correct and no runs are scored in the first inning, we win our bet and are paid out a profit of $83.33. All of the other bets listed will operate in the exact same fashion, except the determining factor of the winner or loser will be different. A lot of times you can make multiple bets if you think something, in general, is going to happen, but aren't sure exactly how it will turn out. Here is what we mean. Let's say that you think the LA Dodgers are going to come out of the gate extremely hot. You think they are fast starters and you think they're being underestimated. Now, there is no specific prop bet that just says "Team to come out hot," but there are several prop bets you could bet that would happen if you were correct. Score in the first inning - You could bet this because you think they're going to come out hot and score. Team to score first - You think LA is going to be hot early, so they'll probably score first if you are right. Team winning after the first inning - The team that comes out hottest will usually be winning early. All of these bets will effectively mean what you think is generally going to happen in the game. The more right you are, the more of them that you are going to win. This also allows you to hit a couple of your bets and miss on some and still come out a winner. Let's say you're right, but the Angles score a fluky first run off of an error. After that, the Dodgers score six runs in the first inning just as you predicted. If you had only bet on the team to score first, you would lose your bet even though you were correct. If you had bet all three, though, you would win 2/3 of your bets and still show a profit on your correct prediction. This is a list of golf prop bets that were available on a UK based sportsbook for a golf tournament. As you can see, it again does not classify the prop bets, but just lists them like all of the other regular bets offered. These may all look like fun prop bets at first, but there are actually a few skill based prop bets in the above example. Let's look at them one at a time. The first bet offered is if any player will get a hole in one or not. This is strictly a for fun entertainment style prop bet. Yes, you could make the argument that if you think a golfer is perfect enough, they are more likely to get a hole in one, but you're effectively still guessing. If you don't believe us, take a peek at the likelihood of holes in one. The second bet offered may seem like a fun bet on the nationality of the winner of the tournament, but it is actually a highly skilled wager. Let's say you have five golfers that you think are going to have a shot to win this tournament. You could go and places five futures bets on these golfers, but you would be cutting into your profits. What you could do though is take a look at the nationalities of the five golfers and see if there is a trend. Let's say that you do so and realize that four of the five golfers are American. You can now place a wager on the American nationality winning the tournament, and you've got an 80% shot of winning if your prediction of one of those five winning is correct. The payouts listed here are in decimal format which is very common in Europe and other parts of the world. Determining how much you are going to win is as easy as multiplying your bet times the number listed. Remember, the number that gives you will be the full amount that the sportsbook will give you which will include your original bet. For example, let's say you bet $100 on the American bet and you win your bet. You want to see how much you will get paid, so you multiply $100 by 2.10 and get $210. This means that you will profit $110 on your bet. The $210 you get includes your original $100 bet that is returned and your $110 in profit for winning your bet. Calculating winnings with decimal odds is extremely easy as long as you remember that it does include your original bet. One of the best things about prop bets, specifically the skill-based ones, is that they allow you to have an immense amount of flexibility when it comes to using the knowledge and trends you've noticed. Without prop bets, a lot of the hunches and predictions we make would go wasted as we would not be able to bet on them. For example, let's say you think that Rob Gronkowski is going to absolutely blow up in his next game and score at least two touchdowns. Without prop bets, the only way you could try and bet on this would be to bet on the Patriots and hope that his performance is enough to propel them to a victory. Not ideal. With prop bets, though, you can place a wager directly on how you think that Rob Gronkowski is going to do in the game. You can bet "Rob Gronkowski will score more than 1.5 Touchdowns." If he scores the two or more touchdowns as you think he will, you're a winner. It doesn't matter how terribly the rest of the team does or even in the Patriots win the game. You now have the ability to bet on exactly the thing you want to. Here's a great article that talks about the history of prop bets and also the flexibility and variety of bet types that people love to bet on. Ever have a significant other or friend that doesn't understand sports betting that you'd like to introduce to it? Prop bets are a great way to get them interested in the game, even if they have limited knowledge of the sport. They might not have any idea who is winning or playing, but if you tell them they win their bet if the kicker kicks the ball through the uprights three or more times, they'll understand that for sure. It's a great way to get someone introduced to a sport and sports betting and slowly turned into a fan. Anyone can get behind cheering for Gatorade to be a particular color. We've definitely touched on this one quite a bit throughout this article, but it would be an incomplete benefits list if we didn't mention it here. Prop bets are a fantastic way for you to leverage more specific knowledge to make money. The flexibility we talked about earlier will allow you to use every bit of information and every trend you uncover to make predictions to make serious money. Remember to be careful with the fun prop bets if your sole goal is to make some money. They are amazing for entertainment value but can be a real drag on a money making strategy. This is another one that we've touched on, but we can't leave off the list of benefits. There's really no better way to say it; prop bets are fun! There's a reason that during some of the biggest games of the year, like the Super Bowl, that millions and millions of dollars come in on prop bets. It gives you things to cheer for no matter how the game is going. Even if your team is down by four touchdowns, you could still be cheering for a prop bet player to score one more time. If you're betting on anyone scoring in a certain quarter or inning, it allows you to cheer for both teams no matter how the game is going. The bottom line is that prop bets are not only a great way to make money with sports betting, but they're a lot of fun.